Bumper is rated 4.3 out of 5 by 6. Bumper stickers make a statement wherever they are. Wide range of sizes between 2" x 2" and 12" x 18"
Rated 5 out of 5 by MartinAustinTX from Just as designed! Quick production and delivery. Actual sticker appears as designed. Bumper stickers are more than a promotional tool-- they are a pop culture classic. 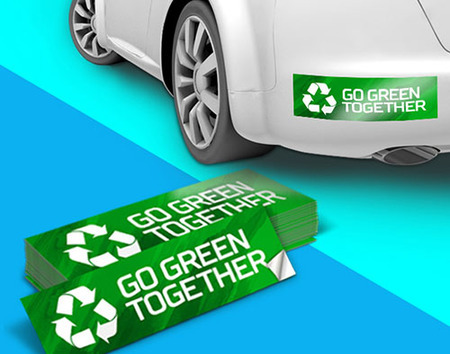 Durable and built for outdoor conditions, bumper stickers have graced millions of car bumpers and windshields and are the go-to choice for almost every vehicle sticker application. But bumper sticker printing aren’t just for cars. They’re often applied on laptops, bike frames, office equipment, filing cabinets, equipment cases, suitcases, and more. Bumper stickers aren’t just for drivers. With our choice of shapes, and stocks finding the right combination for any application is easy. Make your own bumper stickers today. Use our Bumper Sticker layout templates to ensure your artwork and designs are sized and formatted correctly. PrintPlace.com layout templates can be downloaded for each Bumper Sticker size below, in an EPS, PDF, or JPG format for Illustrator or Photoshop. You can print bumper stickers in two standard shapes -- square and rectangle. Here’s our recommendations for their specific application. These are just the right shape for many popular square and round logos. They’re also great for giveaways where recipients are less likely to own cars, such as in dense urban centers or school campuses. The square shape makes them a popular choice for band logos. The classic rectangle bumper sticker offers plenty of space for text logos and statements, great for putting on any smooth surface wide enough to accommodate them, such as laptops, and of course bumpers. We recommend a UV coat for any stickers for cars and other vehicles. The length makes them perfect for slogans, jokes, and political statements. Order bumper sticker printing today.